Matriks AS offers solutions, instruments and services to pharmaceutical, environmental, chemical and biochemical industries. Our main products are within liquid- and gas-chromatography, mass spectrometry, ICP-MS, UV-Visible Spectroscopy and systems for protein and DNA/RNA analysis. Matriks is the authorized reseller for Agilent Technologies in Norway (see "Leverandører" for other vendors). 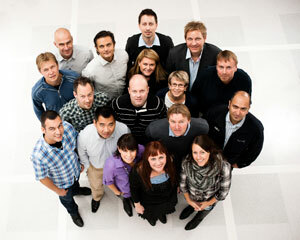 Our team of 24 people delivers solutions to the customers in our market. The interesting and positive people in "The Matriks team" have extensive experience and competence in chemical analysis and analytical instruments. Our goal is to have continuous development of our team to make Matriks able to offer the best solutions and services to our customers. The Latin word matrix (spelled "matriks" in Norwegian) means mother. In mathematical terms a matrix is a grid of rows and columns that make a system. Matrixes can be very large, complex and difficult to solve, just like a lot of chemical and biochemical analysis methods. Our aim in "Matriks" is to join together all the different parts of the analytical methods and solve the challenges in close cooperation with our customers. Right click/save as to save this logo.